There are now hundreds of pasta choices at grocery stores and restaurants. While endless pasta options sounds exciting – and delicious! – it can be easy to get confused when you’re looking for a quick, tasty, and healthy pasta dish. We break down the main types of pasta, their nutritional benefits, and the dishes they work best in. Known for its milder flavor and tenderness, white pasta is sometimes called “refined.” Classic white is a great blank canvas for adding veggies and protein. From a nutritional stand point, white pasta and whole wheat pasta are equally as healthy. White pasta contains vitamins and minerals such as thiamine, riboflavin, folic acid, iron, and niacin. In response to dietary guidance urging Americans to include more whole grains in their diets, manufacturers have introduced whole wheat pasta varieties. Whole wheat pasta contains the vitamins, minerals, and phytonutrients found in the entire grain and promotes a healthy diet. Gluten is a protein found in wheat and related grains like barley, rye, spelt, faro, and bulgur. Aside from pasta, a few popular foods made from these grains are breads and cereals. Gluten helps pasta maintain its many shapes and gives it the slightly chewy texture. Gluten-free pastas can be made from ingredients such as rice or corn. 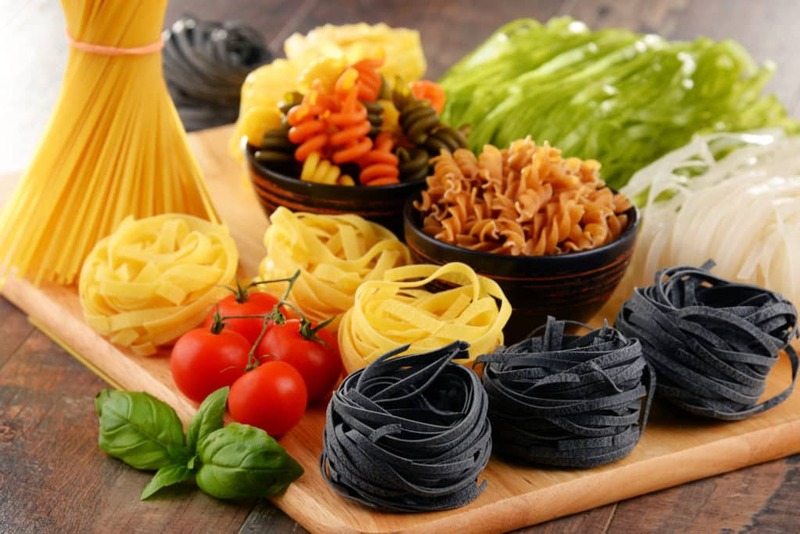 While gluten-free pasta is tasty and can be a preference, individuals who have not been diagnosed by a doctor with a condition, such as Celiac disease, derive no nutritional benefit by choosing to eat gluten-free pastas. Rice pastas, sometimes referred to as rice noodles, are made from rice flour and can often be found in Asian grocery stores or in the international section of supermarkets. Versatile with mild flavor, they’re often used in stir-fries and soups. With a delicate texture and no gluten, rice noodles are perfect for those who have a gluten sensitivity or allergy.